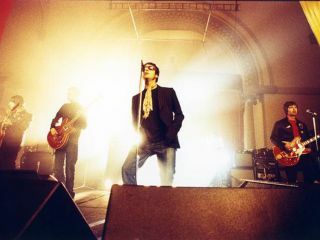 From today (14 January) MySpace Music and Oasis's MySpace profile page are streaming a new 18 minute Oasis documentary. Filmed by The Malloys - directors of numerous White Stripes videos - the documentary was filmed in September 2008 prior to the release of current album Dig Out Your Soul. The idea was simple, but novel. Give various New York street musicians the sheet music to new, unheard Oasis songs, and let them perform their own interpretations. Singer Liam Gallagher, guitarist 'Gem' Archer and bassist Andy Bell were on hand to witness rehearsals. Main songwriter Noel Gallagher was, at the time, recuperating from a stage attack that left him with three broken ribs. Oasis songs on saxophone and flute? The documentary is fascinating for any Oasis fan. For one, Liam Gallagher appears genuinely impressed by the quality of the NYC players. And you get to hear Oasis songs played on sitar guitars, electric violin, double bass, sax and flute. And tambourines, naturally. Kudos to the NYC musicians who did such a good job - the film says more about their talents and NYC subway music culture than Oasis's superstar existence. "It makes me feel normal," says Liam Gallagher in honour, before admitting the street musicians' versions just might be more intriguing than the Oasis album itself. "Nice one, you fuckers!" Maybe buskers should record any forthcoming Oasis songs? Watch the documentary on the Oasis Myspace page.